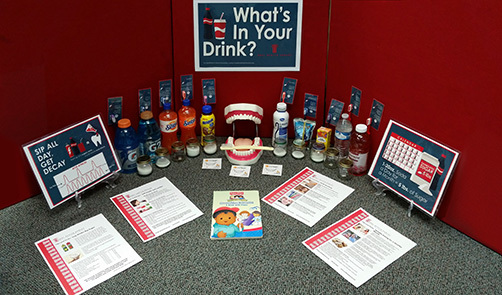 Oral Health Kansas’ Sugary Drink Displays are an educational and fun way to consider the amount of sugar in popular drinks. We make month-long reservations for the displays and send them out for events and organizations all over Kansas. 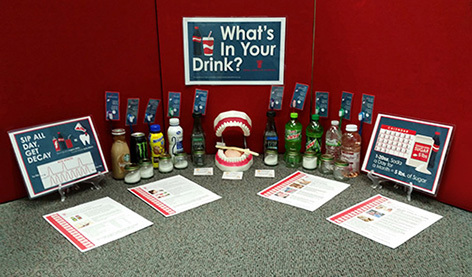 Perfect for all ages, the drink display shows how much sugar (in teaspoons) is contained in commonly consumed drinks such as chocolate milk, sports drinks, soda, and more. Fun facts and books about healthy habits and large models of the mouth are also included in the display. There are two versions of the drink displays. The adult display image 1 and child display is image 2. Supplies are now in English and Spanish. Reservations depend on availability of drink displays. We will do our best to fulfill requests of less than 30 days but there is no guarantee. If you are interested in reserving a Sugary Drink Display for your event or organization, please click here and fill out the reservation form. "I was amazed when you see the sugar in the jars-how much sugar is really in those drinks! Eye opening!" "I thought the display was very informative." "The last time we had a display one of our teachers quit drinking Dr. Pepper 'cold turkey' and is still sticking with it! I'm so proud of her"-Ms. Sue, Butler Community College."